5793 labyrinths found. Showing 3541-3560. Sorted by country, state, city, then zip/postal code. This location is protected and secure housing for women in transition so the precise location is undisclosed. 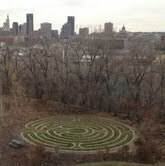 Labyrinth is available by appointment. Please call. 3-circuit medieval patterned from the three inner circuits of the Chartres labyrinth design. Often available Wednesday evenings in the Chapel, but call first to ascertain availability. 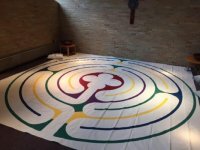 7-circuit concentric medieval style Circle of Peace design painted with scripture verses and prayers to form the walls of the design, continues to evolve as more colorful and artistic renderings are added. 6-circuit medieval Abingdon pattern with a trefoil center. Painted in the liturgical colors of the Christian church year. Located in an interior courtyard. 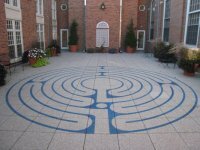 Labyrinth is located in an interior courtyard that is accessible only when the church is open. 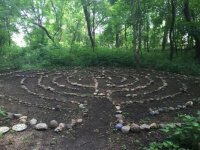 Swedish labyrinth in the Linnaeus Arboretum at Gustavus Adolphus College. 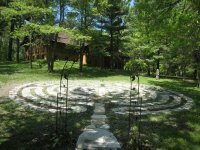 Located on the western edge of Gustavus Adolphus College, the Linnaeus Arboretum provides the College and community with a living sanctuary of plants and animals for education, recreation, reflection and stewardship. 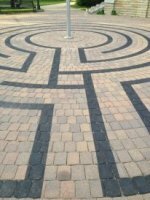 Parking is located 25 yards from the entrance to the Arboretum, and our labyrinth is located in the Meditation Gardens area. It can easily be seen about 100 yards to the northwest from the pavilion at the Johnson Waterfall Garden at the entrance of the Arboretum. 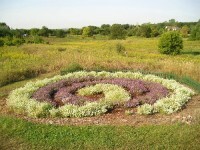 The Arboretum is open to all visitors, year-round, during daylight hours. 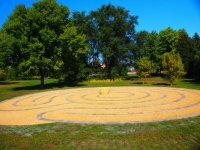 Baltic Type - Swedish labyrinths traditionally consist of stones or boulders set into the soil in a circular or spiral pattern, with an entrance that doubles as an exit located on the south side. 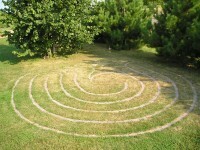 The oldest Swedish labyrinths were found on the Baltic coastline. N 44 19.236° Lat. ; W 093 58.562° Long. © 2004-2019 Veriditas & The Labyrinth Society. All Rights Reserved.